BC’s #1 Home Show Producer! Visit a Home Show Near You! For more information about upcoming shows or reserving a booth in our next event, please contact us at 1-800-471-1112 or info@homeshowtime.com. Whether you are looking at building or buying a new home, or embarking on some home renovations, Home Expos produced by Evergreen Exhibitions Ltd. are a great way to find unique, custom, and cutting edge products to create your dream home. Our Exhibitors bring newest and best of everything for your home to the shows so you can learn about new products, see in-booth demonstrations, and make the best choices for your upcoming projects! Attend a Home Show in your community to get tips and advice from home experts and get inspired with the latest trends in home products! Find inspiration on interior decor and design tips, home organization ideas, decorating on a budget, decor trends, and more. Evergreen Exhibitions produces Home Shows all over Vancouver Island and the Lower Mainland. Find a Home Show in your area! 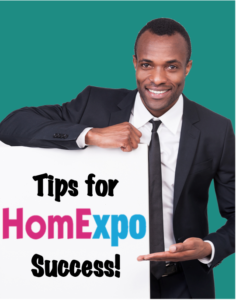 If you are looking to participate in a Home Show you will find all important Exhibitor Information here. The art of designing the interior decoration of a room or building. Natural elements, land forms, terrain shape, elevation, and water. Enhance your home with money saving new windows and doors. Cost effective solutions for your home heating and cooling needs. Update your bathroom or custom design your new home decor. A state of the art kitchen and dining room design for your home. Envelop your home with the roofing technologies for your home. Build your ideas for your new home or that renovation project. As with anything in our life, there comes a time when you need to replace your Home Expo display. A car shows its age by becoming loud and rusty, but do you know when it’s time to replace your Home Show display? When participating in a Home Expo, you’ll usually have an 8-foot or 10-foot booth space to showcase your products and services. But, so does everyone else at the show, and usually there are even larger booths to attract attendees’ attention! So, how do you catch their eye? We are heartbroken to share news of the passing of our fearless leader, Doug Hope. On August 14th, Doug passed away suddenly. More details are provided below. How did your last Home Show go? Did you get the result you were looking for? If not you may need to look at your booth to ensure it’s giving potential customers the right information. Evergreen Exhibitions Ltd. shared a post. Thanks for checking out the show Goldstream News Gazette!